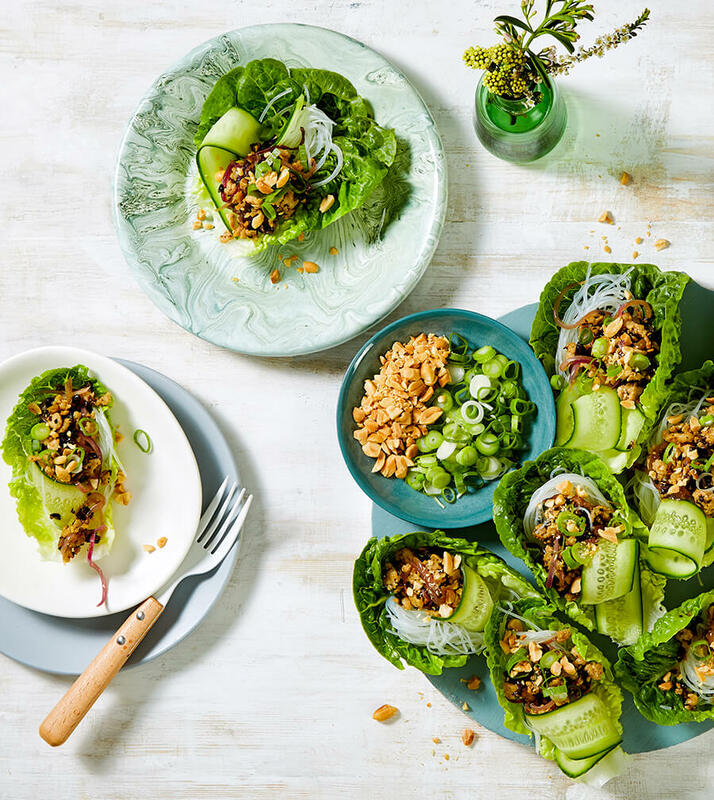 Packed full of flavour, these chicken lettuce cups make the perfect light summer meal. Combine the ingredients for the sauce in a jar. Screw on the lid and give it a good shake until all the ingredients combine. Set aside. Prepare lettuce cups by chopping off the stem of the lettuce and carefully pulling each lettuce leaf/cup away from the head of lettuce. Set aside and repeat until you have 12 lettuce cups. Heat 1 tablespoon of olive oil in a fry pan over medium high heat. Add the mushrooms and sauté them for 3-4 minutes. Place in a bowl and set aside. Add the remaining olive oil to the fry pan and cook the onion over medium high heat for 1 minute before adding in the garlic. Let the garlic cook for 30 seconds before adding in the chicken mince. Break up the lumps in the chicken mince using a wooden spoon and cook for 5-7 minutes or until it cooks all the way through. Add the mushrooms back into the pan and drizzle with the prepared sauce. Let cook for 1-2 minutes. Remove from heat and allow the filling to cool for a few minutes. Spoon the chicken filling into the lettuce cups. Top with a handful of vermicelli rice noodles, spring onions, cucumber ribbons and chopped peanuts and serve immediately.